Gay: It is extraordinary, isn't it, that the old riffs will still do it on a playout, if you really punch it in....it's extraordinary isn't it? Rory: It is, but the strange thing is that you can spend, as we did, maybe 10 years trying to be very clever- clever sometimes and update the riffs and change the. ..you know, try and use the roots base and be European-clever with it, but it's a no-win situation - you end up just to be able to play like T- BONE WALKER riffs or whatever with your own original stamp is really what I've found lately that. ..you know, I've got 25 more years of this to try and learn! Gay: You reckon do you? Rory: Oh God yeah ! Gay: 25 years at least yeah? Yeah, you don't go into the Heavy Metal stuff though, you don't go THAT far over . Rory: No, I don't, but, I mean my attitude about Heavy Metal is that Eddie Cochran, for instance, if he were still alive today, he would be a Heavy Metal artist. I don't like to be a snob about it, but say in the last 5 years, I'm moving back towards the real origins of the music . Gay: Are you really, yeah? Simplify? Simplify? Rory: Simplify, cutting down and just trimming it down a lot. Gay: What I find most interesting about that is, that 20 years ago, certainly when you were starting to listen to that stuff that you were listening to and I was starting as well, we rarely would have thought that you would ever see the day that an Irishman, a Cork man, IN Cork would get such adulation - I mean that is the BIG change, isn't it, yourself and Van the Man and all the other people, you know, it's extraordinary. Rory: Well , its great. I mean I think the sad fact in Ireland is that quiet often the whole Blues and R&B side of things is overlooked, because lately a lot of the groups, good groups, that are in Ireland and in Western Europe, they're all very white oriented, you know what I mean? And they don't have this….I think for a while a lot of youngsters thought that if a man sat down with a 12 string guitar in a chair, that he was like the black equivalent of Seamus Ennis or something, if that doesn't sound daft. But I think lately, now again, I'd like to think people are beginning to reappraise the great original blues players because that's the you know , really. Gay: For such a laid-back guy, you certainly put a lot of action into a show like that, are you banjaxed after that now, all that leaping about, carry-on? Rory: That's my son ( laughing) he does all that, I just play the squeeze-box and the acoustic, you know. No, oddly enough , I get more worn out when I'm off the road from nervous tension. I'm better off when I'm touring. I wallow in it and I become fit, you know, whereas if I'm just doing you know, rehearsals or just doing little bits in the studio or something, I become really….. I don't know, less together than when I'm on tour. Gay: You can't be bothered with the business of the business, you can't be bothered with the arrangements and the contracts and the recording guys and the minders and all that? Rory: Yeah, well I've always tried to simplify the whole business things as best I could, but the thing is that, for a couple of years , I kind of didn't keep an eye on certain people in the early days, so now I have to be a little bit awake at the crack of dawn to make sure things aren't wrong, but, in general, I just like to play and play every night. Gay: OK, another 20 years now, that will make you 62, you're going to keep on till you're 62? You're going to stay in the business till you're 62, learning the guitar? Rory: (laughing) your mathematics are better then mine, eh? No, I mean it's just that Chuck Berry just turned 62, I mean if I can be anything like he is at that age, I'll be more than happy, you know. Gay: You will, you will, I tell you what, I'll do a deal……When you retire at 62, then you can start teaching me how to play the guitar, OK? Gay: Have we got a deal, OK? 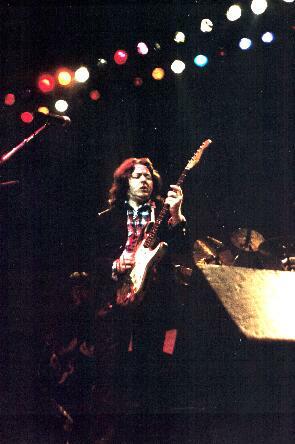 Gay: Alright, well done, good luck to you, RORY GALLAGHER, ladies and gentlemen.